I've attached a picture of our newly adopted dog, Axle. He's approximately 4 years old according to the vet's estimation. 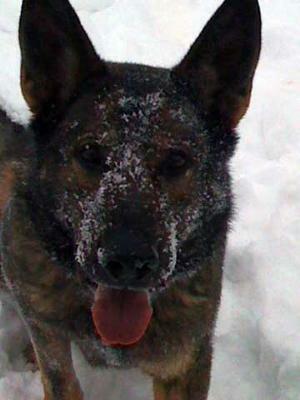 In this picture, he'd been playing in the snow with his beloved Kong ball. Despite the frigid temp that day, he wanted to stay out as long as he possibly could. Thank you for the opportunity to share him with others. I truly appreciate your site and all of the information here. Hi Kristina . Thanks so much for taking the time to come here and share your own personal German Shepherd rescue story and picture of your beautiful German Shepherd Dog Axel with us all here at Total German Shepherd. And what a great picture of Axel too. He looks so happy - just like he has just conquered that big old snow bluff and is waiting for his next challenge. Beautiful. Did you take the shot? Either way, it is a great photo of him. Nicely done - he is so handsome!